Wintriss Controls Group, Acton, MA, will demonstrate its LETS asset-utilization and OEE data-collection software, used widely to collect data from metal-stamping presses and also capable of collecting data from press brakes, laser-cutting machines, tube lasers, turret presses, machining centers, automated saws, welding machines, injection-molding machines and paint lines. The LETS Machine Interface (LMI) picks up signals from the machine to report its operating status, production rate and parts count (where applicable). 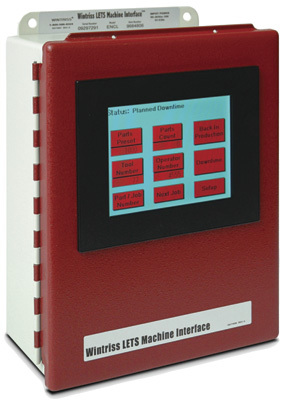 A color or monochromatic touchscreen allows an operator to select a downtime reason from a user-configured menu. Built-in Ethernet connectivity allows the unit to communicate with the LETS server over an existing network, displaying real-time status information for all machines on any PC on the network without the need to install any special software.